How to Make Money as a Writer — Yes, it can be done! Writing: it’s a rewarding experience, but it doesn’t always create spendable rewards. Writers can be inspired and creative, but we do not always have the best business minds. Our June panel for writers presents a panel of generous people who have actually made money within the profession of writing! Writers, you can make significant bucks if you apply yourself – not only to the craft of writing, but also to the business of writing, and to promoting yourself and your writing wisely. Our panelists of writers, editors, and professionals will present ideas for authors to consider: growth and marketing ideas that have demonstrated their effectiveness and are potentially available to all. Zac Hug is a television writer, playwright and essayist. With a BFA in Theatre from NYU, and an MFA in Creative Writing from the University of British Columbia, Zac spent many years as a Digital Media Executive for Bravo, The View, and ABC Family, before becoming a TV writer on Drop Dead Diva (Lifetime) and Shadowhunters (Freeform). His plays have been produced by the New York Fringe Festival and the Williamstown Theatre Festival Workshop, among others, and Zac wrote and produced the web series THESE PEOPLE. Zac continues to work as a freelance digital media consultant and writer, and lives in Los Angeles with an old-lady housecat named Katherine. MARK MILLER has sold movie projects to Warner Brothers, been a writer/producer on numerous TV sitcom and variety show staffs, a humor columnist for the Los Angeles Times Syndicate, a humor blogger and Great Gigs interviewer for The Huffington Post, a writer and interviewer for The Jewish Journal, a staff writer for Weekly World News, and he is a part of the Los Angeles storytelling community. Mark Miller has also performed stand-up comedy in nightclubs and on TV. His first book, 500 Dates: Dispatches From the Front Lines of the Online Dating Wars. is a collection of his humor essays on dating and romance, is published by Skyhorse Publishing. In his downtime, Mark developed a career as a marketing communications copywriter.His websites are MarkMillerHumorist.com and visualcv.com/markmiller1. Claudia Suzanne is the Einstein of ghostwriting, according to one of her students. Spearheading the movement to elevate and advance professional ghostwriting, she penned the seminal textbook on the subject, founded and teaches the Ghostwriting Professional Designation Program to students around the world (soon to be available in video), produced the first (and still only) international ghostwriters conference, and runs a unique no-risk ghostwriting service staffed entirely with Certified Ghostwriters. Claudia has ghosted nearly 200 titles, including bestsellers and, award-winning novels – even memoirs optioned for film. A recognized book-industry authority she is the author of This Business of Books: A Complete Overview of the Industry from Concept through Sales, now in its 5th edition. Colette Freedman is a screenwriter, novelist and playwright. Her play Sister Cities has toured the world; Colette also wrote the film. Her musical Serial Killer Barbie and her play The Affair have played in the US and Europe.Here nine novels include The Thirteen Hallows (with NYT best seller Michael Scott), The Affair, The Consequences, Anomalies, and Steve Dorff’s memoir I Wrote That One, Too.Colette co-produced the award-winning film Quality Problems and wrote/ coproduced 2017 LA Film Festival winner And Then There Was Eve. Her film Miles Underwater is filming this July. Colette is a top Hollywood script doctor and ghostwriter. Learn more at her website: ColetteFreedman.com. Flo Selfman is a veteran public relations and marketing consultant who has created and implemented PR campaigns for celebrities, authors, and events. She received the IRWIN Award for “Best News Tie-In Campaign” and her press kits have won awards. She is a copyeditor/proofreader for many award-winning books in all genres, and conducts lively on-site grammar and punctuation review workshops for adults. An Ohio native, Flo has a BA in Psychology from UCLA, a California Secondary Teaching Credential, and the Instructor Development Certificate from UCLA Extension. She served as IWOSC president 2003-2016. Roberta Edgar is co-author of the nonfiction book, Rezone and Grow Rich, and editor of the recent Evolution by God. In addition to writing screenplays, Roberta has been ghostwriter and development editor on a number of projects, including fiction, nonfiction and memoir. After graduating from UCLA, she wrote editorial promotion content for Mademoiselle magazine. She also worked for documentary filmmaker, David L. Wolper and, later, the producers of the original Star Trek. In addition, Roberta co-wrote for Norman Lear’s sitcom, All That Glitters, and a number of (unproduced) screenplays. 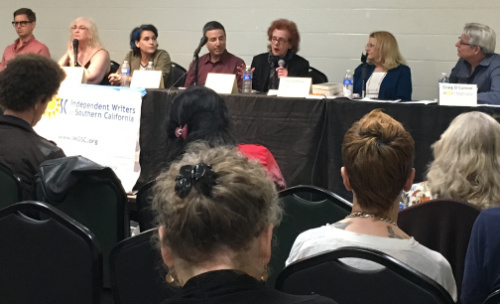 Roberta is Vice President of Independent Writers of Southern California (IWOSC) and a longtime member of Writers Guild of America West. Visit Roberta’s website at: wordslamode.com. Trained as an urban planner and geographer, during his nearly forty-year career as a consulting planner, Craig was constantly writing up background descriptions, analyses and plans for public and private clients. This process coupled with the joy of discovery helped prepare Craig for a major, now eighteen-year book project that looks at, listens to, and attempts to portray the creation myths recorded by Native Americans from across the Americas into a basic epic story. Along the way, Craig has written a few stories for local publications and has accumulated a backlog of stories to tell. He also serves on IWOSC’s Board of Directors. Advance registration is now closed. You may come tonight, pay at the door and attend, as we do have space in this room.